I hope you all had a nice Easter. It was a really easy going one in our house, totally calm and relaxed. And that was great! Here is the last recipe in my Romanian Easter recipes series, I chose this to be the last because I thought many will like to find a way of eating all those cooked eggs leftover from Easter (I still have about 15 of them, the children were diligent when coloring eggs this year). So here are my deviled eggs filled with homemade liver pate. So delicious, that even people who would not eat liver in any other way, totally love these eggs. It is a typical Romanian way of filling eggs, the one I’ve eaten most of the times as a child. Actually my grandma only ever made two versions of the deviled egg: this one with liver pate one and the mayonnaise – egg yolk one. Both good, but this was always my favorite. We did eat lots of liver (chicken mostly) in Romania in those times, so I had only heard it on TV (American movies and series) that many people actually don’t like liver. That was really surprising, fried chicken livers was for us kids really like a favorite meal and we were always happy when my grandmother cooked it (with mashed potatoes and onions – yum!). But then I met my husband and if there is one food he would not even consider eating is liver! But despite that, he loves this homemade liver pate. And my kids also, you would not believe how quickly these eggs were gone! You could make this pate for filling eggs, but not only. 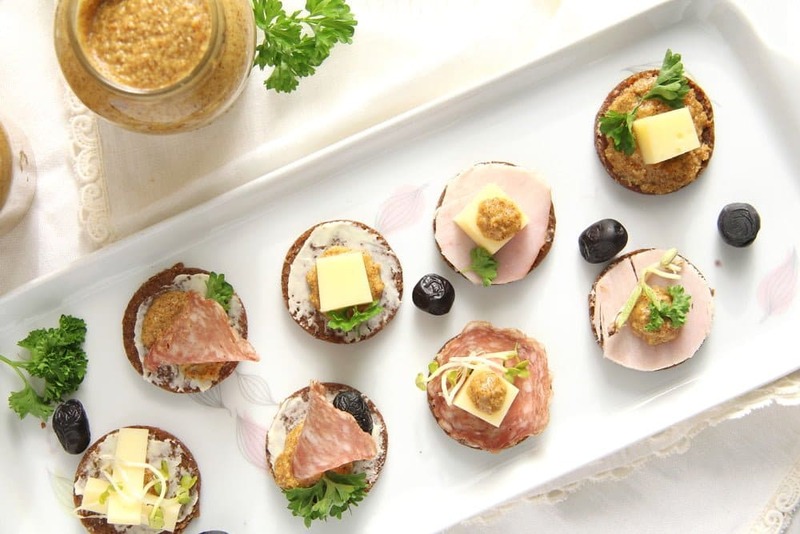 It is delicious eaten on bread instead of the bought liver pate, it is a world of difference in taste and texture. I normally like liver pate or liver sausage and buy it from time to time from a good butcher, but I’ve never liked any bought sort as much as I like this homemade version. It is soft and silky and it tastes out of this world. Even if it’s your first time with liver, give it a try, I think you will like it. 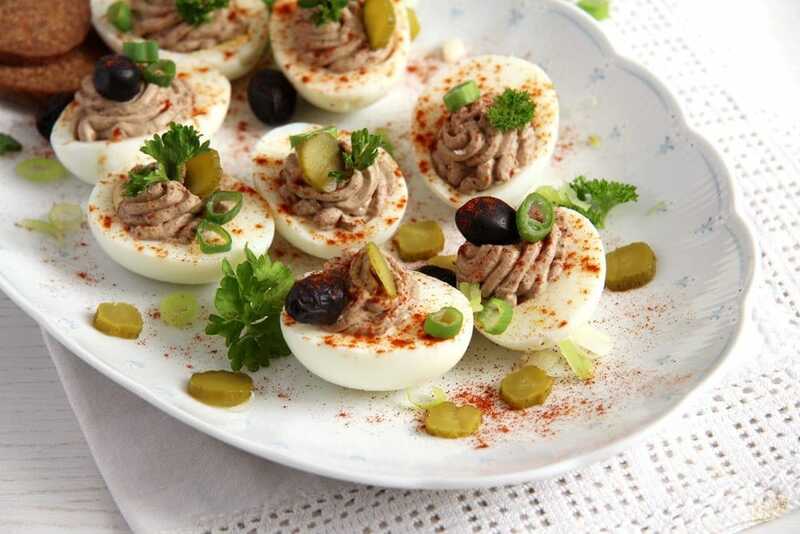 These deviled eggs are not only a good way of using leftover Easter eggs, they also make a great appetizer or nibbles for a party. To finish, I hope you enjoyed learning a little bit about traditional Romanian cooking and stay tuned for a new batch of recipes starting on Saturday: Schnitzel in six different ways! Cook the eggs until hard and leave to cool completely. Halve the eggs, remove the egg yolks and place them in a bowl large enough to hold all other ingredients (or the bowl of your kitchen machine). In the meantime wash the chicken livers and dry them well with kitchen paper. Chop the onion. Heat 1 tablespoon of the oil in a non stick pan. Cook the onion until golden brown and remove from the pan. Place into the bowl containing the egg yolks. Heat the other tablespoon of oil and fry the chicken livers on all sides, turning often, until brown on the outside but still a little pink in the middle, it will take about 4-5 minutes. Take out of the pan and leave to cool. When cool, chop the liver into small pieces and give them to the bowl. Mix the egg yolks, onions, chicken livers and crème fraiche. Blend until smooth and add salt to taste. Transfer the filling into a piping bag with a star nozzle and pipe the mixture into the egg halves. Sprinkle with sweet paprika powder and garnish to your liking. 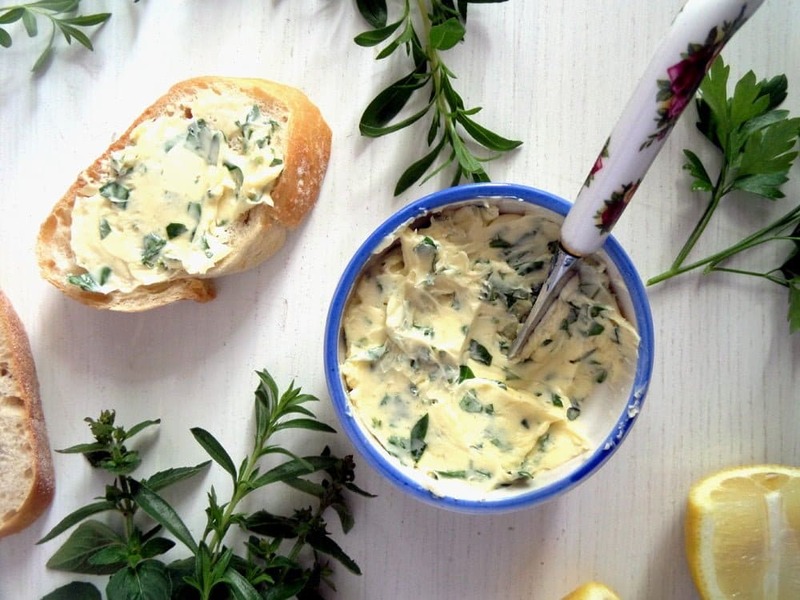 You could use gherkins, olives, scallions, parsley, dill or other fresh herbs. Refrigerate until ready to serve. This is a different version of deviled eggs for me. 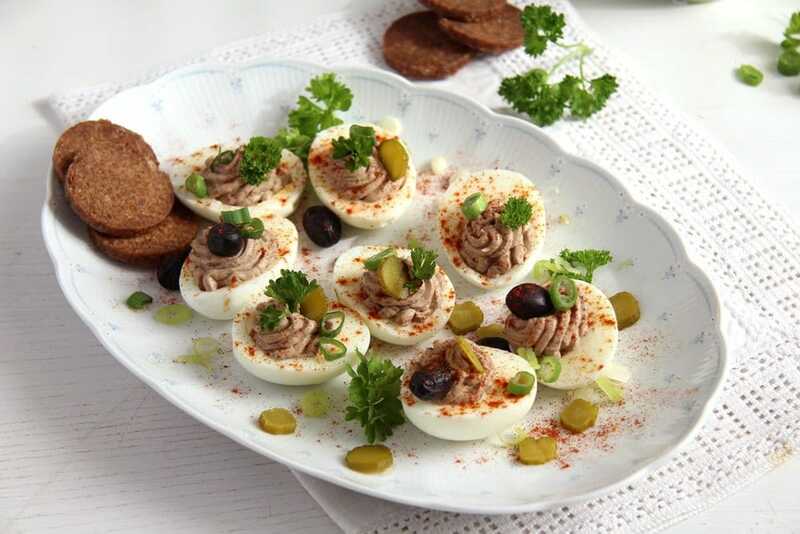 I enjoy pate and deviled eggs. Combining the two makes sense and sounds delicious. 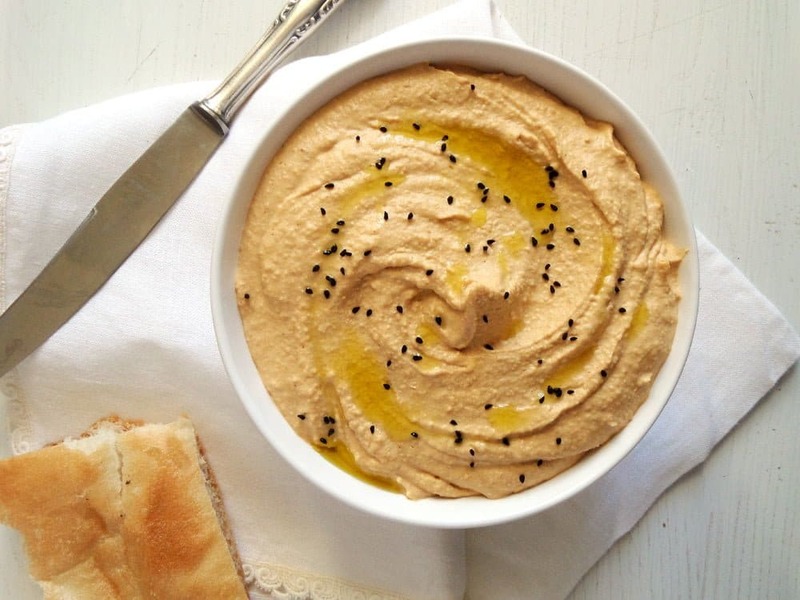 It is so soft and creamy (when not cooked to death) and has such a delicate, yet particular flavor, I don’t really get why so many people don’t like it…. There is no version of deviled egg that I won’t try, and this one looks amazing! I love chicken liver with a purple passion. Thank you, Kate, I love chicken liver too, but don’t get to eat it as often as I’d like too. 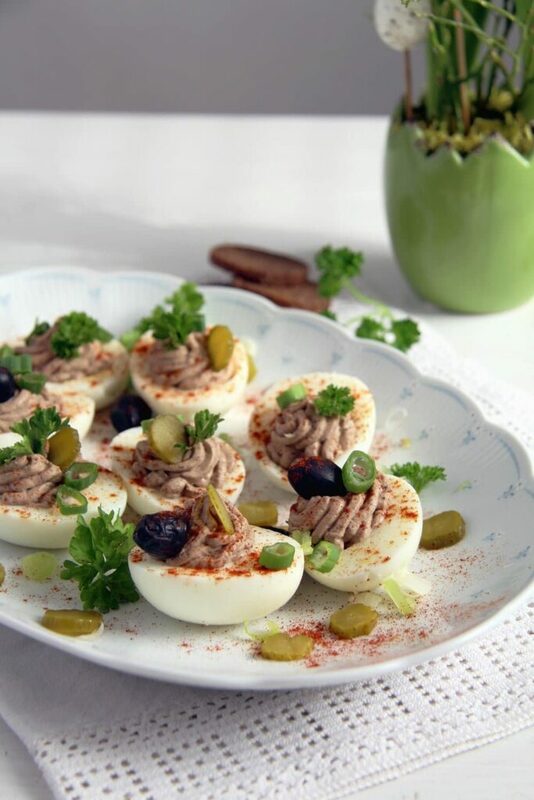 What a great spin on deviled eggs. I’d love to try this. Looks great! They must be extremely rich and delicious with homemade liver pate!! Oh wow! How adorably delish these deviled eggs look, Adina. Homemade liver plate sounds fantastic. Wow, I don’t like liver either even though my mom made it i the most appetizing way possible BUT I’m quite sure I would gobble up these eggs! I think you would, Chris. My husband detests liver, still he loves this filling. 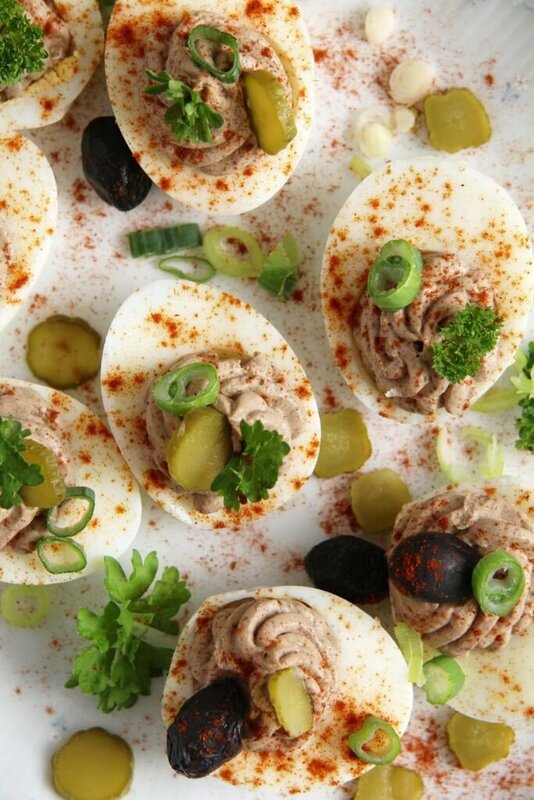 Obsessed with this twist on deviled eggs! awesome recipe adina. I am vegetarian but my hubby used to eats eggs sometimes so i always found trouble to find egg recipes which i can serve to my hubby..